Henry (Joe Morton) is blinded by Grace's (Tembi Locke)... SCIENCE. We have another episode with Zoe, this time visiting Eureka and giving Jack more stress over guy issues. She fills a good role in this episode--not too much, not too little--though we do end up rehashing the “Zoe is near death” angle. Carter gets to have some very emotive scenes as a result, so despite the rehash, it’s not all bad. We get to check in on Jo’s housing situation, after Larry’s out-of-control rocket destroyed her house in “The Story of O2” (Episode 4), and it is the starting point for kicking off the major crisis. There isn’t a single strong sub-plot in this episode, so we’re treated to explorations of some of the many running sub-plots, as well as the introduction of a new one involving Dr. Grant and the surprising return of a character from earlier seasons. The scenes with Jo, Fargo, Dr. Grant, and Zane trying to discover who’s accessed Dr. Grant’s falsified personnel file are kind of lackluster, and I thought Zane’s use of an older model MacBook Pro was a bit... unrealistic, and kind of disappointing. This is Eureka we’re talking about! You’d think their portable computing devices would be something proprietary and insanely advanced, not a consumer-level machine from 2008. Anyway, I’m picking nits... it just seemed a bit sloppy to me. The Dr. Grant sub-plot seems to hint at a conspiracy, which is something I’ve found ‘Eureka’ doesn’t handle well. There was the Consortium thing (or whatever it was called) from the first season, and while there were one or two interesting scenes about that, ultimately I felt the storyline was weak and there was little to no real payoff. So far, this new sub-plot has me yawning. I did enjoy the Henry/Grace scene, with our Henry duplicating “other” Henry and Grace’s first date. It was at least touching, if not actually interesting, and it did illustrate the point that Henry is now in competition with “other” Henry for Grace’s affection. 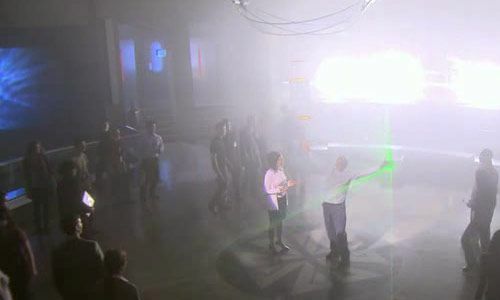 There’s a scene later in the episode where Henry, having learned his lesson, is “blinded by science” in a very entertaining way. The whole scene plays out heavy on the cheese, but I liked it anyway--I don’t want to see many more scenes like that, but I enjoyed this one. Another sub-plot revolves around Jack’s renewed efforts to woo Allison. Zoe comes to town and plants a seed of doubt, Carter and Allison cross signals a bit, and he spends much of the rest of the episode trying to figure out the implications. Finally, it gets to a point where Jack and Allison are having a pointed discussion, which is when you’d find me trying to give advice to a character on TV. It seems to end well enough, however, so, for the moment, I’m satisfied. As for the surprise character from earlier seasons--obviously I'm trying not to give it away because it's supposedly "exciting." I can’t say I ever really cared for this character. I didn’t care for the story surrounding them, and wasn’t upset when they left the show. I’m trying to reserve judgement until more of the story comes to light, but with the little tease we got in this episode, I’m currently not all that excited by it. That said, this was an enjoyable episode overall, even if we have rehashed some things and dredged up some of the lesser plot lines from earlier seasons. What we got was fun, and very ‘Eureka’.